I was going to share a savoury recipe with you guys today, but then I remembered muffins are a thing. How I neglected their existence in the first place, I have no idea, but I do hope the muffin population forgives me. Considering I am largely responsible for depleting said population, they probably won’t, but oh well. Muffins have always brought me joy. 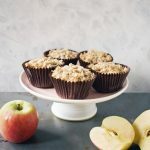 Don’t get me wrong, I love cupcakes as much as the next person, but muffins are healthier, easier, and cosier than their icing topped counterparts. That’s three ticks for me! One time when I visited Canada as a child, we went to a food court bakery and ate a blueberry muffin. Let me tell you, it was HUGE. Between myself, my mum and my sister, we still had some leftover! I think this was when I realised North Americans really do ‘go big or go home’. 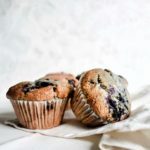 These homemade bakery-style blueberry muffins are more British-portion sized, but they still have that deliciously fluffy interior, and classic bakery-style taste. 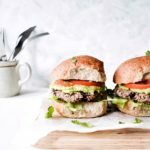 They are also vegan, eggless, and made with just 7 ingredients! 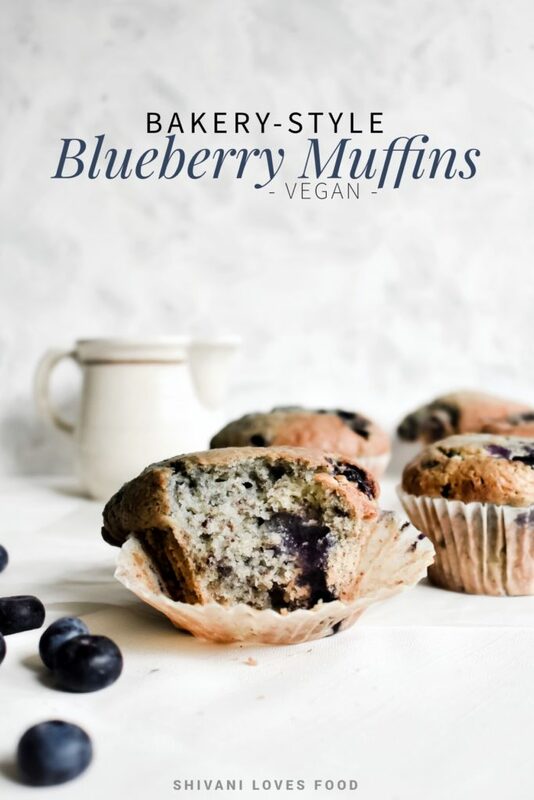 what ingredients are in these bakery-style blueberry muffins? Self-raising flour and baking powder. For that fluffy interior we all know and love. 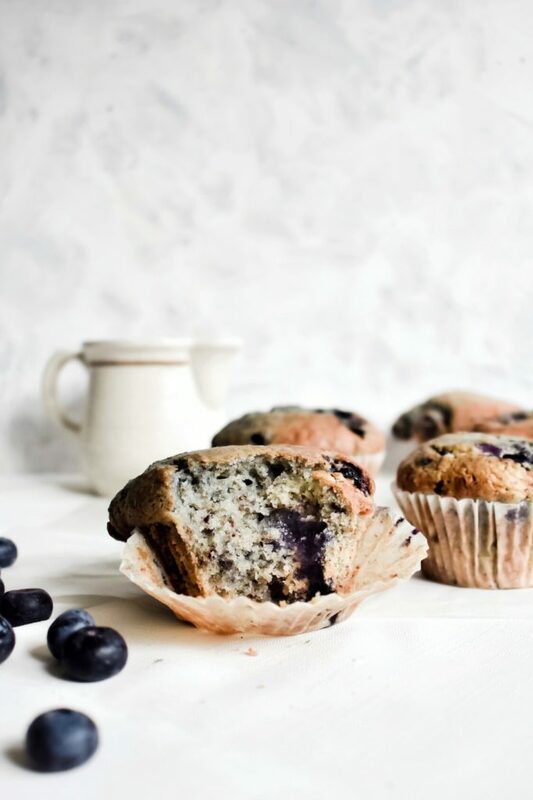 Let’s be honest, these muffins are basically edible pillows. Sugar. I used caster sugar which is not the healthiest type of sugar, but I’m pretty sure it’s what they use in the bakeries. Feel free to sub in date or coconut sugar if you want to make them naturally sweetened! Sunflower Oil. 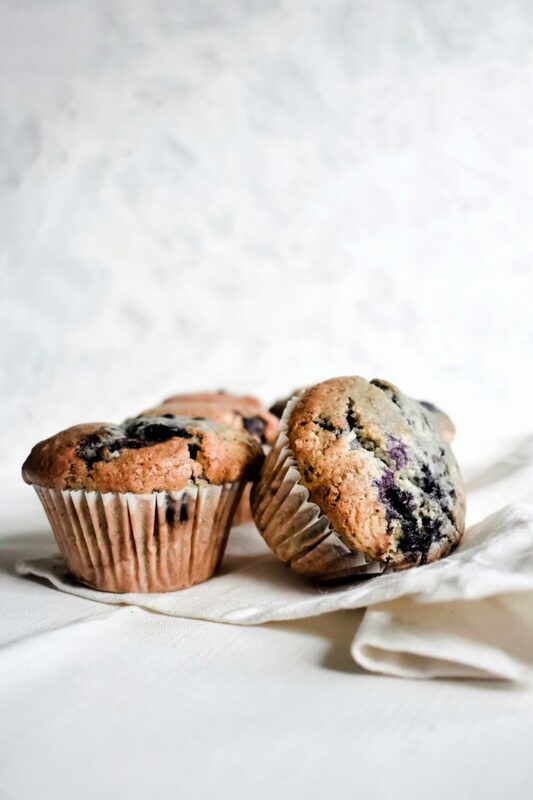 Oil is the traditional fat of choice in muffins, and it’s what gives muffins their characteristic taste and texture. Soy milk. Or homemade almond milk if you are feeling extra fancy. Flax eggs. Okay, now we are getting on to the exciting ingredients! For those unfamiliar with the term ‘flax egg’, it is 1 tbsp ground flaxseed mixed with 2.5 tbsp water, which when left to rest, forms a gel-like substance called mucilage. A flax egg has similar consistency to a chicken’s egg, and acts as a binding agent in this recipe. How cool is that? Blueberries. 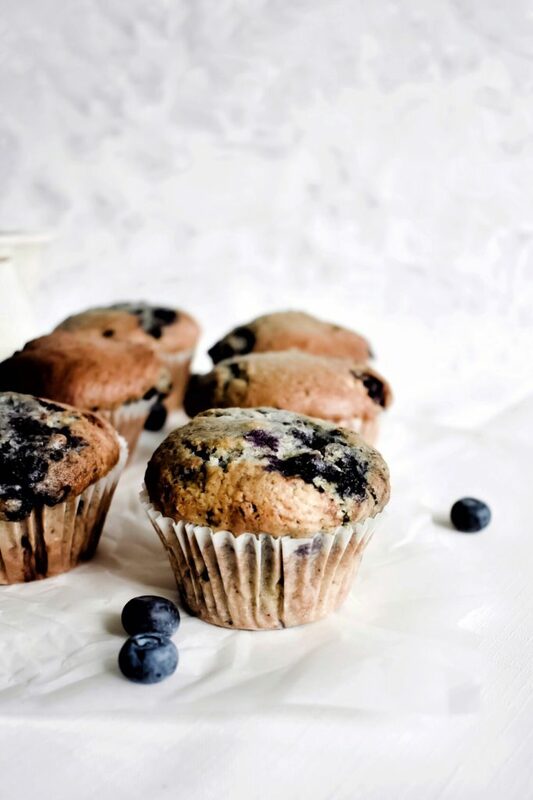 It wouldn’t be a blueberry muffin recipe without blueberries, right? 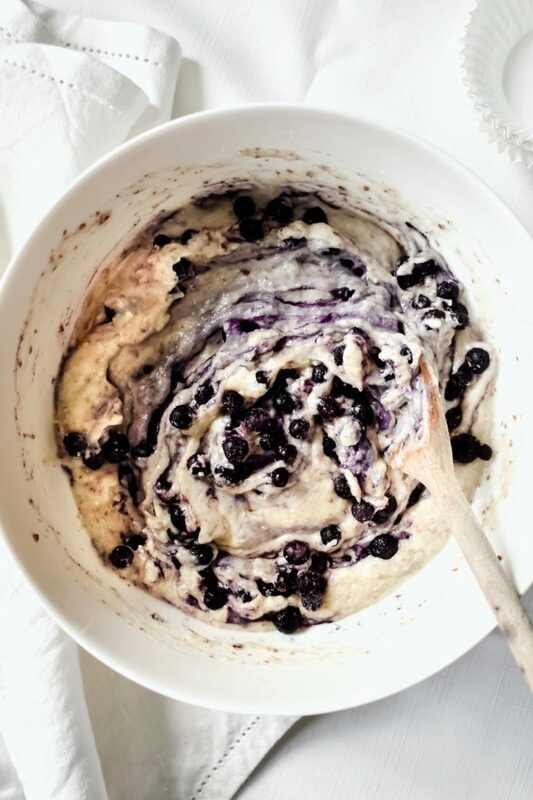 I used frozen blueberries in this recipe (hence the dreamy purple batter swirl pic) but you could sub fresh if that’s what you have on hand – I won’t judge. If you try this recipe, make sure to tag me on Instagram @shivanilf. I love to see all your creations! You can also keep updated with me on Facebook and Pinterest. I hope to see you there! In a small bowl, mix the ground flaxseed and water. Set aside. In a large mixing bowl, stir together the flour, baking powder, salt, and sugar. Make a well in the centre and pour in the oil, soy milk, and the flax eggs. Stir gently to combine. Add the blueberries and stir until evenly distributed. Divide the mixture between the cases. 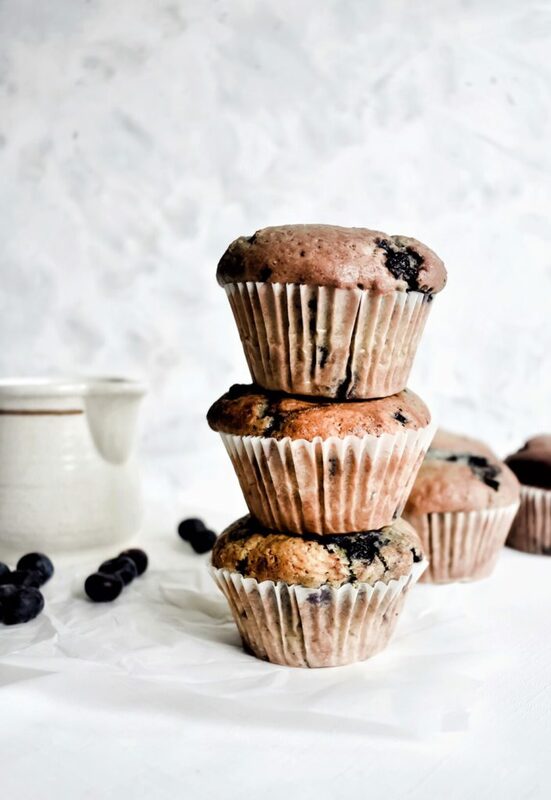 (For larger muffins with a ‘muffin top’, fill 6 cases all the way to the top. For slightly smaller muffins, fill 9 cases 2/3 of the way). Bake for 18-22 minutes until golden. Leave to cool in the tin for a few minutes before serving warm. Thank you so much Madhu – I’m so glad you like them!